Thermography – Breast Thermography – What is Thermography? Thermography is a unique and vital technology shown to be effective in uncovering hidden health issues. Today, breast cancer is a major health risk to all women. Early detection and prevention is the key. Thermographic imaging is a mammogram alternative which takes a thermal picture to determine abnormalities or changes in the breast tissue. Breast thermography can detect irregular patterns. Best of all, thermal imaging is painless, non-invasive, and has no radiation. 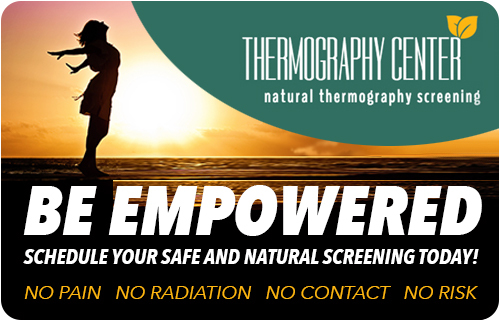 Thermography’s role in breast cancer and other breast disorders is to help in early detection and monitoring of abnormal physiology and the establishment of risk factors for the development or existence of disease. When used with other procedures, the best possible evaluation of breast health is made. This painless, non-invasive, no-radiation breast screening test is a valuable procedure for alerting your GP or specialist to the possibility of underlying breast disease. This test is designed to improve chances for detecting fast-growing, active tumors in the intervals between mammographic screenings or when mammography is not indicated by screening guidelines for women less than 50 years of age. A patient’s thermal images are kept on record and form a baseline for all future routine evaluations. Thermography is especially appropriate for younger women between 30 and 50 whose denser breast tissue makes it more difficult for mammography to pick up suspicious lesions. This test can provide a ‘clinical marker’ to the doctor or mammographer that a specific area of the breast needs particularly close examination. The faster a malignant tumor grows, the more infrared radiation it generates. For younger women in particular, results from thermographic screening can lead to earlier detection and ultimately, longer life.